Learning effectively is a meta-skill that will help you in every job, and other areas of life for that matter. A meta-skill is a skill that improves your other skills and compounds their effectiveness like compound interest. I previously completed watching Barbara Oakley’s online course Learning How to Learn which is the most viewed online course of all time. A salient quote which summarises their intent is “The brain doesn’t come with an instruction manual, but our goal was to write one”. To help you learn even more effectively, I’ve compressed the course here into what I view to be the most valuable information presented, saving you approximately 6.5hours. Chunking is a mental process whereby individual pieces of information are bound into a meaningful whole. For example, when learning a new language you may begin by learning the individual letters of the alphabet, but soon you will be able to chunk the letters into syllables, and words. Another example is arithmetic — if we needed to carry around 100 jelly beans in our pocket to prove that 10 jelly beans by 10 jelly beans equals 100 every time we performed the operation 10x10, that would not be very efficient. Soon we acquire the ability to chunk 10x10=100 without performing any further mental steps. Research shows that it helps to form chunks before trying to understand individual pieces. One applicable example is, if reading a textbook — it is helpful to overview the table of contents and flick through the book or chapter first to gain an understanding of the big-picture context. Then once you go back and learn individual pieces of information, you will be able to place them within the bigger context and will be better able to form chunks with other information you encounter. Chunks are bound together with use and meaning. Practice and repetition build and strengthen each chunk, improving your ability to retrieve it from memory and figure out solutions to problems. Chunks are best built with focused attention, understanding the basic idea, and practice to gain the big picture context. These are the three key steps to making a chunk and fitting it into a bigger picture. Chunks are important but they don’t necessarily involve building flexibility which is necessary for expertise. Recall is very important to learning. It is essentially attempting to remember what you have learnt, unprompted. Most people re-read books or write down elaborate notes, and other ineffective strategies for improving understanding. Research shows that by simply practicing recalling (eg, trying to write down or verbalise as much as they can about a chapter they have read, after completing it), students learned at a much deeper level than other other technique (including mind-mapping, etc). So practice recall, it makes your studying more effective — saving you time and effort. Illusions of competence are behaviours that lead students to believe that they understand something more than they actually do. Glancing at a solution before you have blind-tested yourself on it, and thinking you understand it is one of the biggest illusions of competence. You must first arrive at the solution yourself, and then check your answers. Highlighting and underlining are also illusions of competence. Doing these can trick yourself into believing that you are understanding something more than you actually are. Instead, if you do highlight try to understand the main ideas of the whole chapter first before going back to highlight the main ideas. Notes in the sidebar that synthesise key concepts are a good idea. Testing yourself improves your ability to remember it. Wanting to learn material and spending time is not sufficient. You must test yourself on whatever you are learning. Recall is a form of testing, and allows you to make low-risk mistakes. Practising recall in different locations also improves effectiveness, because it increases the context you understand the information in — rather than a small library corner. So perhaps practice recalling on your walk between classes or different locations. In a lot of ways, learning and training the brain is like training a muscle. The brain best learns with periods of intense effort followed by rest and recovery, repeated over time and getting progressively more difficult. Cramming learning into single sessions is as ineffective as lifting weights as heavy as you can once. A better method is spaced repetition. Spaced repetition spaces your learning out over time, and reduces the depletion of willpower. 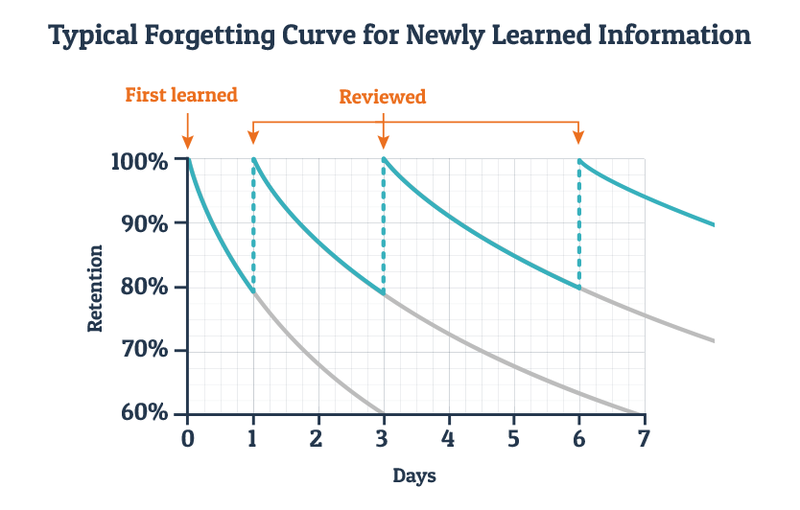 Research shows that people often underestimate the benefits of spaced repetition when learning. It enhances retrieval and is the most effective long-term learning strategy to prevent the forgetting of information. Flash Cards are one tool which allow you to utilise the power of both testing and distributed practice. Anki is a great tool which utilises algorithms to space out and mix cards. Memrise is useful for premade flashcards. To begin with, handwriting begins helping you encode the information to your memory. You should also say the word and it’s meaning aloud to begin the encoding process. Do the flash cards of what you have learnt, in order. Them interleave them by mixing them up which increases context. Then practice them again before sleep. Now briefly practice for a few minutes each morning over the next several days, gradually extending the time between each repetition. After reinforcing the learning several days, you can experiment with practising the deck once per month or every couple of months, or however often suits you. The benefits of extending your practice over several days is actually why tackling procrastination is important, so that you can start studying earlier. Deliberate practice is the idea that the most effective way to learn isn’t to overlearn what you already know, but instead to focus on getting better at pieces which are most difficult, and overcome them. Mastering a new subject means learning the chunks. Basically instead of using the finite amount of working memory which gets filled quickly when novices are using a piece of information, experts have delegated it to their long term memory in the form of chunks which frees up their mind to hold more information. Chunks are interestingly energy-saving mental habits. Actually, the point of habits is that they save energy. People place more emphasis on intelligence than necessary. Yes they are important, but deliberate practice may be just as or moreso. Deliberate practice on the toughest parts can get inadequate intelligences on par with natural learners or talented people. Approaching material with the goal of learning it on your own can give you a unique path to mastery. Taking responsibility for your own learning is usually one of the most important things you can do. Changing your mind and admitting error is a virtue of intelligence that usually gets people farther than others with higher intelligences or talent. That is the virtue of the less fortunate — you will be more inclined to be persistent and work harder to defy the always present prejudices of others about what you can accomplish. Procrastination can be a single monumentally important bad habit that influences many other areas of your life. Overcoming it can improve many other areas. It is similar to addiction in that it involves temporarily avoiding bad feelings. Procrastination is caused by the material giving you temporary unhappy feelings, and so you funnel your attention onto a more pleasant task and it makes you temporarily happy. Avoiding procrastination requires willpower, and willpower is a scarce mental resource. But procrastination is essentially an energy saving-habit, like a chunk. Habits involve a cue; a routine (series of behaviours); a reward; and a belief about all 3. Procrastination is an automatic habit which is usually unconscious like a zombie. Whenever you are studying, you can either be studying for the process or the product. Let’s say you are learning to program. Focusing on the product would cause you to think “I want/need to finish this course”. Focusing on the process would cause you to think “I want to spend 30 minutes learning”. Research shows focusing on the product is what triggers the pain to procrastinate. So to overcome it, a helpful reframe is to set up process-based behaviours (eg. “ill study for 20 minutes” over “i need to finish studying”). One effective way to do this is with pomodoros. The pomodoro technique involves setting a 25 minute timer, and studying for the duration of the timer, followed by having a 5 minute break. Every 5th cycle you get a 10 minute break. Pomodoros help you get started, and allow you avoid distractors for the duration of the pomodoro, as you’ve delegated them to your break time. They can be an especially useful tool in changing your reaction to distractors. Another way to avoid procrastination is to minimise distractors. Distractors are usually cues like a message on our phone which draw our attention away from the task at hand. Cues are usually location; time; how you feel; and reactions (to other people or events). You can avoid distractors by removing them completely. For example, for the duration of a pomodoro turn off your phone and internet, or study in a different room such as in a library. You should also reward yourself for completing your tasks, whether that be a latte, tv, watching a movie, or a purchase for bigger milestones. Make sure your mental zombies get lots of rewards. Deliberately delay rewards until you finish tasks. But remember: the better you get at something, the more enjoyable it becomes. You should also make a weekly list of tasks in a planner. And then each day the evening before (to free up your working memory, and help your subconscious work on it), create a to-do list of key tasks for the next day that you can reasonably complete the next day. Planning your quitting time (eg “I will stop studying at 5pm”) is just as important as planning your starting time. Commit yourself to certain routines and tasks each day. Savour your feelings of happiness and triump. “Eat your frogs first in the morning.” Do the most difficult key task the first thing after you wake up, in the morning. This helps improve procrastination as you are less likely to be mentally fatigued. Humans have outstanding visual and spatial memory systems. Evoluntarily, it is more advantageous to remember “where things are, and how they look” over the names of things. Long term memory is like a storage warehouse where you retrieve and deposit items. Working memory is like a blackboard that you wipe after you finished with the task. Working memory can only hold around four items, which is why mastery compacts the idea in some sense and uses less space in working memory to free up mental space. If you tap into our outstanding spatial and visual systems, it will improve your memory. To begin tapping into it, begin by trying to make a very memorable image representing 1 key item — the funnier and more evocative, the better. Also make it multimodal by trying to feel, hear, and smell it. Then place it into a familiar place like your house or university. Using this technique called memory palace you are able to speed up chunk acquisition and become an expert more quickly. Again, repetition over several days is very helpful. They are very useful for remembering unrelated items. For items that don’t lend themselves to visualising, like the numbers or chains of words, try Mnemonics or association. An example of mnemonics is Never Eat Soggy Wheatbiscuits for NESW representing the order around the compass clockwise. If you need to remember the number 11, try associating it with something familiar like a conventional running time off 11 seconds, or 1911, a year which may represent something for you. Again, try to keep it visual. These are some of the best things you can use to not only remember a concept, but understand it. The more visual the better. They’re just a way for you to realise that one concept is similar to another. One example of a metaphor is electricity is like flowing water. It’s sometimes useful to imagine you inside the concept. This is a popular method in physics. If they aren’t completely effective, they are at least helpful at helping you get a sense for beginning to understand a concept. No analogy or metaphors are perfect, but then, nothing in science is. Every theory is a model that breaks down at some point. Exercise is more effective than any medication or any technique on the market at improving memory. Do it. Sleep is also incredibly important. If you don’t get a reasonable nights sleep before a test, everything else you do might not matter. Not only is being a teamplayer important for career building and success, as we all know. But it is also a more efficient way to learn. Although student groups can be bad at times and distracting, they can be powerful tools for learning. Sometimes it’s not enough to use more of your own brainpower, everyone has blind spots and thinking errors. One of the best ways to catch thinking errors in yourself is to brainstorm and focus with others who are smart and focused on the same topic. They can compound your effort. Space out your study over time, dont cram. Use spaced repetition (ie anki), esp with flashcards. Learning is like building a muscle. Use deliberate practice — have specific goals, focused on improving weaknesses; intensely focus; receive rapid feedback. When reading overview first to gain context, and practice recall at the end of each chapter. Avoid highlighting until you understand the key ideas. Procrastination is a bad habit. To avoid procrastination, change your beliefs and focus on the process, not the product. Reward yourself for milestones. Use pomodoros and set aside study time not study ends. Planning: Have a weekly planner containing key tasks. Write out key to-dos each day, before bed the proceeding day (to remove from working memory). Eat your frogs first (do the most difficult task first). Experiment with different learning methods and log what does and what does not work for you. Mnemonics, Memory Palaces, and Metaphors/Analogies are three techniques which utilise our strength of spatio-visual memory systems. (also use other senses to strengthen further) Also imagine yourself inside the concept. Exercise and Sleep have the two largest effects on learning, moreso than any drug or technique. Sleep moreso. Lack of sleep can invalidate all studying. Prepare to be wrong and admit errors (reduce overconfidence), and be persistent in your learning. You can learn anything. Utilise hatred-motivation. Teamwork is helpful, and allows us to correct errors of thinking. Test taking is an important tool for structured recalling. Full-Stack Developer from Sydney, Australia.